To train their officers, federal law-enforcement agencies have awarded contracts to contaminated commercial gun ranges, riling unions and sparking calls for reform. Champion Arms in Kent, with dozens of lead violations, won a contract with the air marshals. In early November 2008, state workplace-safety inspectors slammed a contaminated commercial gun range in Kent with 15 violations, including failure to fix previous lead hazards, and fined it $42,400. The very next day, the Transportation Security Administration (TSA) awarded Champion Arms in Kent a five-year contract worth $205,200 for the Federal Air Marshal Service to use the indoor gun range for training. Federal law requires agencies to follow health and safety standards. But for years, the Federal Air Marshal Service and the Federal Bureau of Prisons put hundreds of their employees in danger by having them undergo firearms training at two lead-contaminated commercial ranges where owners have sickened workers and repeatedly violated safety and health laws. Neither agency here has its own gun range. Champion Arms and Wade’s Eastside Guns in Bellevue each had outstanding violations for inadequate ventilation and lead-contaminated surfaces while benefiting from the contracts. “It’s disgraceful and it’s so egregious,” said Frank Terreri, president of the Federal Air Marshal Agency, which represents the air marshals. Air marshals, who provide armed security on certain flights, must prove their proficiency with a service firearm at least four times a year, he said. “We don’t have a choice where they send us to shoot,” said Terreri, a supervisory air marshal in San Francisco. Terreri said this problem could be a national one because nearly all of the agency’s regional offices don’t have their own gun ranges, and marshals have to train elsewhere. He wants to know why the TSA entered into the contract and why workers weren’t warned about potential risks. He became aware of the issue when interviewed by The Seattle Times. Several hundred Bureau of Prisons employees from the SeaTac detention center trained at Wade’s gun range during what public-health officials have called the nation’s worst-known case of lead contamination at a commercial gun range. Joe Mansour, the national health-and-safety union representative for prison employees, has demanded that the Bureau of Prisons investigate how this happened. He has asked the SeaTac facility to notify all staff members about the potential exposures and offer blood tests to those who are concerned. On Oct. 22, 2012, a group of Federal Bureau of Prisons employees from the SeaTac detention center entered the shooting range at Wade’s Eastside Guns. Among them was Mansour, a case manager at the center, who recalled that Wade’s resembled a construction site, with plastic covering sections of the building. That fall, 46 workers at Wade’s had been overexposed to lead during the remodeling. Inspectors from Washington’s Department of Labor and Industries (L&I), which enforces workplace-safety laws, would find 18 violations, mostly related to high lead levels on surfaces and in the air, poor ventilation and lack of safety training. “I wasn’t aware of the lead contamination,” Mansour said in a recent interview. That October day at Wade’s, prison employees spent about two hours in a classroom there and about two more hours shooting in the range. Owner Wade Gaughran kept Wade’s Eastside Guns open during a renovation that overexposed 46 workers to lead; federal employees who shot there at the time weren’t notified. L&I tested the air in the range weeks later. It was so concentrated with lead that state officials asked owner Wade Gaughran to close it down until the lead was abated, L&I records show. “Based on those results, the public and law enforcement employees would only have to be in Bay 1 for 49 minutes to be exposed to airborne lead above the PEL (Permissible Exposure Limit),” an L&I supervisor wrote to Gaughran. No one alerted administrators at the SeaTac detention center about the toxic workplace. Gaughran didn’t immediately close the range. He had no comment for this story. L&I said he has fixed all violations. Mansour said he was shocked the Bureau of Prisons wasn’t checking the safety record of commercial gun ranges before awarding contracts. He also said he was outraged Wade’s managers didn’t inform detention-center employees about the lead hazards before they spent hours inside the Bellevue range. As the union’s national safety representative, Mansour is demanding that all federal detention centers that contract with commercial gun ranges provide proof that Bureau of Prisons employees are shooting in hazard-free ranges. In some cases, that may require an inspection. Employees at the SeaTac detention center have used Wade’s for firearms re-certification since 2008. In 2010, the state cited Wade’s for seven violations, mostly for lead. Jill Sjodin, public information officer for the SeaTac center, declined to answer questions about lead contamination at Wade’s. Violations, fines and other information about company inspections are publicly available on OSHA’s enforcement website. Congress and the Obama administration have tried to tackle the issue of companies being awarded federal contracts despite a history of violating workplace-safety laws. Last year, President Obama signed the Fair Pay and Safe Workplaces Executive Order, which takes effect in 2016. It requires companies seeking federal contracts to disclose previous safety violations. However, the order has a loophole — it applies only to contracts larger than $500,000. Champion Arms and Wade’s Eastside Guns won’t have to disclose violations because their contracts are much smaller. The TSA awarded a contract to Wade’s in 2004, with annual contract renewals for four more years. In 2008, however, a Federal Air Marshal Service employee showed up at the Bellevue range and tested the air and surfaces, Sean Eals, an instructor at Wade’s at the time, told The Times. The marshals didn’t shoot there again, Eals said. “The fourth option year was not exercised … at the discretion of TSA,” Michael Pascarella, assistant supervisory air marshal in charge, wrote in an email. He refused to say exactly why TSA didn’t renew the Wade’s contract. The Times has not received public records it requested about the contract. Terreri, a national representative for the air marshals, said that if TSA didn’t pick up the option for the fourth year because of lead hazards, it should have immediately notified any of its employees who trained at Wade’s to have blood-lead tests. 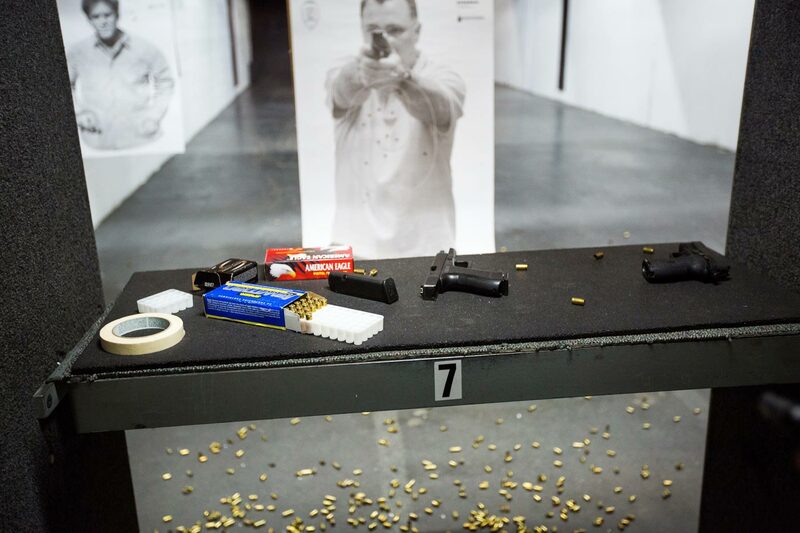 The Center for Investigative Reporting and PRX, with The Seattle Times, talk about the dangers police face from lead contamination at gun ranges. TSA’s “different vendor” turned out to be Champion Arms, which has racked up dozens of lead violations and had two employees overexposed to lead. “This is the worse (sic) indoor firing range … investigated certainly recently and potentially ever,” Cheryl Christian, a state L&I expert wrote in an email to a state lawyer as they contemplated shutting the range down in April 2009. Records show the ventilation system at Champion Arms hadn’t worked properly from 2005 until May 2010. A 2006 L&I inspection found 15 violations, almost all of them posing a substantial probability of death or serious physical harm to workers, records show. The air marshals started shooting there in 2009. Another L&I inspection revealed 10 more violations in 2011. TSA contracted with Champion Arms in 2013, with renewal options through 2018. Owner Maria Geiss didn’t return phone calls for comment. L&I said she has corrected all violations. Before employees ever set foot in any gun range, Terreri said, TSA should first independently check the violation history and ventilation to determine if it is safe. Christine Willmsen: cwillmsen@seattletimes.com or 206-464-3261. On Twitter @christinesea. Lewis Kamb contributed reporting.